Steak and Shake chili is made at Steak and Shake they promote that their burgers are made from steak quality meat. You can make the Steak and Shake Chili in the 5 way style. 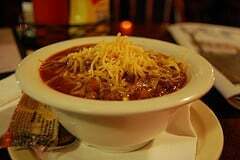 This dish combines spaghetti, home made chili, chili sauce, freshly grated cheddar cheese and minced onions. Steak and Shake chili is a tasty chili. Make your own Steak and Shake Chili at home. Please note the onions that are cooked in the chili are optional. You can leave them out. I personally love onions when cooked in the chili. Steak and Shake does not add onions to cooked chili. Chopped onions are served on top of the chili. In a skillet on medium-low heat saute ground beef and onions. When beef has been cooked, drain all grease and place in a medium-large saucepan. Add celery salt, tomato sauce, kidney beans, garlic powder, garlic salt, chili powder, pepper, water and salt, mix all ingredients. On low heat place a lid on the saucepan and simmer for one hour, stirring frequently. After chili has been cooking for an hour add tomato paste and stir well. Place lid on the pan and simmer an additional half hour. Prepare spaghetti as directed and drain. To assemble: For individual serving: In a shallow bowl or plate place: Generous helping of spaghetti 3/4 cup Chili 2 tablespoon Chili Sauce Chopped Onions (to taste) 1/2 cup Shredded Monterey Jack and Colby Cheese Mix Top with additional onions to your taste. Any leftover chili can be placed on crisp tortilla chips for a light lunch or a great snack. Chili sauce can be purchased at most grocery stores in the condiment area. It is sold in a glass bottle and looks somewhat like the old glass Heinz Ketchup bottles. So, after all this commentary and dispute, does anyone have a recipe that REALLY tastes like Steak and Shake? I find it the best chili I’ve ever eaten, especially in the fast-food arena. The liquid/sauce is to die for. I would welcome a recipe that truly hits the mark. It would take me the rest of my life to try all these variations. Brown ground beef and salt in oil. Put soup into blender, blend for 1 minute. Add all to a slow cooker. Drain beef and beans before adding to slow cooker. Let simmer on LOW for 6 hours or on HIGH for 2 hours. I thought there was cocoa in the recipe. I don’t have it in my copycat recipe. People Complaining about the Onion’s Obviously haven’t had the 5 way Chili as there are onion’s on top of it. This recipe is good and is very close to Steak and Shake chili if you don’t add tomato paste. Mine was very close to S n S until the paste was added. The tomato paste ruins it in my opinion. I added a little paprika 1/2 tsp. and 2 tsp. of cumin. When you make this taste it before adding any tomato paste to it. If you need to add some paste a small can would be enough, not two 8 oz cans. So the recipe only calls for 1 6oz can of paste – but I agree I think the paste ruins it. This recipe tastes NOTHING like SnS. As a former Steak ‘n Shake manager, here are my comments. 1) Mac sauce as it is known is made a gallon at a time with 1gallon catsup and 1 cup Worcestershire sauce. 2. Meat comes pre made from and frozen in a 1.5 gallon block. The store puts 1.5 bricks in a big pot with 4 gallons of kidney beans and 1gallon water for 3.5 hours. They stir with a paddle periodically. The other halh block goes on the steam table with a cup of water for chili macs and three ways. If I were making the meat, I would be sure to list cummin and chili powder at the top with ground beef and garlic powder. Not much else to it. Hi Julie, The proper ratio for the sauce is 1 Tbsp Worcestershire to 1 cup of Ketchup since there are 16 cups in a gallon. Thank u so much. I use to work at The Olive Garden and We would Swap food with Steak N Shake. And i asked one of the delivery guys what was in the sauce on a Chili 3 way and he said ketchup and Worcestershire sauce. Thanks for the extra info. ???? Does all the other ingredients above go in the chili too. Or how you posted your reply. Hugh Steak and Shake fan and this was VERY disappointing…… I’ve made other recipes from this site and they were great, but this one wasn’t even close. secret is, instead of chili sauce, use equal amounts of ketchup & Worchester. However, I sometimes taste while putting together sauce. I worked there for 24 yrs. I didn’t know that they made their chili from scratch. where is the cocoa powder and flat cola? I agree this is a chili recipe and it probably is delicious. BUT it is not a kopy kat receipe for Steak and Shakes chili recipe. I am a avid copy kat in the kitchen and the main two ingrediants that set S n S chili apart from the rest are not even included in this recipe. We got Steak n Shake take out yesterday. The chili was excellent but the bowl was so tiny and only filled half full. I poured into my 1/2 cup measuring cup and it was a little more than half of that. My guess we got 6 level Tablespoons of chili at the most. A total rip off. I am sorry you had a bad experience there. No onions in S&S chili! You are correct. Please see the note. Exactly how is this going to be Steak and Shake Chili when their chili has ABSOLUTELY NO onions in it? I know, for several reasons. The main reason is anyone that has actually eaten there can see no onions plain as day. If you think about it, it’s not far from the truth. Not to rant, but in Italy you’ll find a distinct lack of onions in most of their sauces, North or South. You know, according to their ingredients you must be correct. http://sns-com.s3.amazonaws.com/pdfs/sept2010/SNS_Ingredient_and_Allergen.pdf , they do serve a lot of their chili with the onions. I do not agree with your comment that onions only cover up bad flavor. I would not be certain what French Onion Soup would be covering up, I know, maybe bad beef broth. Any remarks that tend to knock out whole relms food/situations are best thought up from people who can only see in black and white. I agree with you on this. I love onions and onion flavor in most of my foods. I’ve even considered chocolate coverd onions. Individuals who dont have their minds open to new flavor options should probably stay away from most restaurant cooking especially Italian foods. How sicilian Chefs got into this im not sure. Chili is as american as it gets taking its roots from Chuck wagon cooks on the trial trying to server hot food that wasnt spoiled. Even they took advantage of wild onions found along the trail as fresh vegetables, and im sure at some point they were used in the chili as well as wild mushrooms. I guess our friend here relies totaly and completely on his recipes for the succesful results in his kitchen. Frankly I can cook and regularly change the ingredients in my recipes according to what is available in my refrigerator at the time. I do this because I understand the value of a recipe. It is the guidline to success or failure based on the talents of the person using it at the time. Why isn’t there a printer link for your recipes so we can copy them off? Actually Ron, there is, click on the share button. There is a print option.